The smallest things in life can bring the most joy. Well, that’s certainly true. But have you ever stopped to consider how happy a cold, refreshing drink on a hot summer day can make you feel? With those sweltering, hot days in mind, we have tested the capabilities of the Sub Zero Ice Maker. It’s always a good idea to keep an automatic ice maker at home so that you can create a variety of cold drinks for any occasion. Read about the Sub Zero Ice Maker to see what makes it a top choice when it comes to serving up refreshments. WHAT IS THE SUB ZERO ICE MAKER? The Sub Zero Ice Maker is an under-the-counter ice maker that can fit compactly into your kitchen. It’s easy to install next to your dishwasher, besides your kitchen sink, or next to the lower cupboard. Despite its compact size, this ice maker is a powerful and effective machine. It is especially renowned for making pure, clear ice. The method used by the Sub Zero Ice Maker is to filter out oxygen bubbles, toxins, and other impurities in tap water. First, the machine slowly pours the water through a metal filter. Then, clear water is dispensed into the ice maker through the other end. This impurity-free ice can help cool down any drink without altering its taste. It’s also a much healthier alternative to store-bought ice or ice cube trays. If you want to serve clean, filtered ice to your loved ones, then this ice maker is the perfect choice. Many of us might wonder how much ice the Sub Zero Ice Maker can produce. Quite surprisingly, this under-the-counter ice maker can create up to 50 pounds of ice per day. This is especially helpful on days like Christmas, New Year’s, or a birthday celebration where lots of ice is required for your guests. The model comes with a filter for creating clean ice. Still, like any water filtration system, the built-in filter in the Sub Zero will eventually need to be replaced. Luckily, purchasing a replacement filter is only necessary after 750 gallons of water have passed the filter. This is the typical amount of ice that families consume in a year, so it’s a good idea to replace the filter at the end of each year. You won’t need to set a reminder to replace the filter of the Sub Zero Ice Maker. The machine comes equipped with a control panel that reminds you when the filter needs replacing. If cleaning the ice maker is an issue, then you’re in for a treat: The control panel also has a built-in detector to remind you when to clean it out. Plenty of ice makers start to under-perform in very hot weather. Thankfully, the Sub Zero will be there and make ice for you on the days you need it the most. Unlike most ice makers, this model won’t break down because of a little hot weather. It can easily withstand temperatures of up to 110 degrees Fahrenheit and still make ice. Finally, the Sub Zero Ice Maker’s most interesting feature is the “Delay” function. Instead of having an ice maker that just produces ice at random times, the Sub Zero will have ice prepared for you when you program it to. From the quality of the ice to the many delay options, the Sub Zero is the best option if you want more for less. There aren’t many ice makers on the market that compare to this ice maker’s level of convenience and low-maintenance. The Sub Zero UC 15 is the main contender for undercounter ice makers. The ice produced by the Sub Zero is crystal-clear, which means that it’s free of oxygen, chlorine, and other impurities that are found in common ice cubes. The sleek, compact look and feel of the ice maker simply makes the ice taste better. The built-in ice scoop is also a thoughtful touch that makes the Sub Zero a very elegant ice maker. 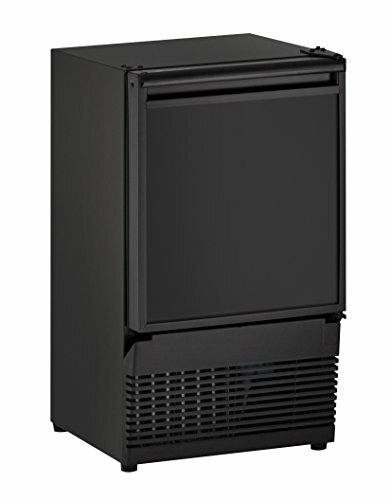 As mentioned earlier, the Sub Zero Ice Maker ranges from $2,000 to $3,000. This is a price range that is shared by many of the ice maker models we've reviewed. For some individuals, this may be a large investment, so be sure to compare and contrast the different prices of the Sub Zero Ice Maker at your local appliance dealers. The built-in ice scoop makes the Sub Zero Ice Maker super easy to use. Since the Sub Zero is an under-the-counter ice maker, some individuals might worry about having to bend down to get some ice. However, we’ve found that the ice scoop makes things easier for both taller people and shorter people. The Sub Zero ice scoop is much longer than it looks, meaning that you won’t have to bend down very far to reach ice for your drinks. It’s also a breeze for children to get ice for themselves, without making a mess in the kitchen. The ice scoop allows smaller children to get ice for their drinks without having to reach for high places. The Sub Zero can easily make 50 pounds of ice per day while holding 25 pounds in its storage unit. Let’s not forget that this ice can be prepared at any time you wish. In any case, 50 pounds of ice is a good amount of ice for an under-the-counter ice maker. The Sub Zero’s design is beautifully simple. The exterior is sleek and compact and covered in stainless steel. The handle is also made of steel, which makes cleanup very easy, as stainless steel is less prone to dust and dirt. The inner walls of the ice maker and the ice scoop are made of a durable, thick plastic that won’t break easily. 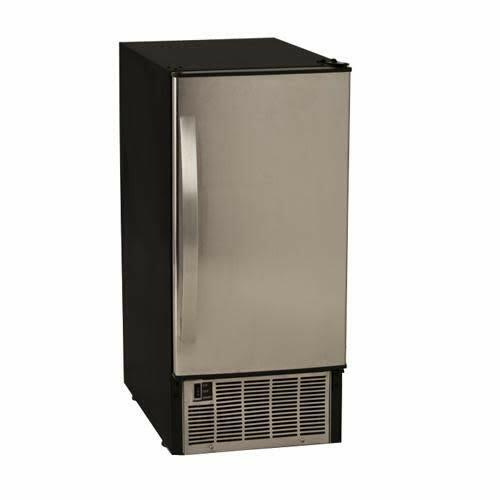 Overall, the Sub Zero Ice Maker has a durable, yet elegant design. This ice maker features a two-year standard warranty, which is a reasonable amount of time. It might be a good idea to invest in the Sub Zero Ice Maker for a year, and then revisit your warranty after some time has passed. However, we can confirm that this is an ice maker we can rely on for a much longer period. The U-Line Ice Maker is very similar to the Sub Zero Ice Maker in its capabilities. It’s an under-the-counter ice maker that specializes in producing clear ice cubes. Many of U-Line’s products feature a stainless steel design, which makes the U-Line an adversary for Sub Zero regarding design. Many of U-Line’s products are on the less-expensive side. The average cost of a U-Line Ice Maker is between $2,000 and $2,500. This is a few hundred dollars cheaper than the Sub Zero Ice Maker. However, the low price may mean that the U-Line has fewer features or user-friendly options. Our experience with the U-Line is that it’s a fairly streamlined process. It makes clear ice that’s free of impurities. However, unlike the Sub Zero Ice Maker, the U-Line Ice Maker does not have a convenient scoop. Because of this lack of convenience, the U-Line is more average. The redeeming quality of the U-Line is its large amount of storage space. It’s able to produce 60 pounds of ice per day, which is 10 more pounds than the Sub Zero Ice Maker. This ice maker is about the same size, shape, and design of the Sub Zero. Both models feature a stainless-steel exterior. However, it is not as elegant or considerate of the user experience. The inner walls of the ice maker don't have any features. As with many household appliances, U-Line only offers a one-year warranty to replace any damaged parts to the U-Line Ice Maker. For those who are constantly in and out of the kitchen, one year might not be a suitable amount of time to decide if the U-Line Ice Maker is a good choice. On its stainless-steel exterior, the Mosel Ice Maker may seem just like the Sub Zero Ice Maker and the U-Line Ice Maker. However, there is one special feature that can’t be found in either of the previously reviewed ice makers. The Mosel model gives the user the options of creating three different sizes of ice cubes, which is a good change of pace from the standard one-sized ice cubes of other models. The Mosel 15" is fairly inexpensive for an under-the-counter ice maker. The price range for the Mosel is between $1,000 and $1,500, making it a much cheaper investment than the U-Line or Sub Zero Ice Maker. If you need an ice maker for your home, but don’t want to invest too much money, then this model may be more suitable for you. As mentioned earlier, the Mosel offers three different sizes of ice cubes. This is a perfect feature for creating an even wider variety of drinks, from iced coffee to iced tea. Of course, these ice cubes are crystal-clear, as the Mosel Ice Maker also has an internal filtration system. The Mosel Ice Maker’s capacity is far less than the other ice makers we reviewed. The Mosel can only create up to 32 pounds of ice per day. That is 18 pounds less than the Sub Zero Ice Maker, and 28 pounds less than the U-Line Ice Maker. The outside of the Mosel is made of stainless steel, just like the Sub Zero Ice Maker and the U-Line Ice Maker. However, the inside of the unit features a user-friendly control panel for choosing your desired size of ice cube. The inviting, easy-to-use look of the design is always an important quality when looking for an ice maker. There is a good variety of warranty options available for the Mosel. It’s possible to choose up to a five-year warranty for this ice maker. However, all warranties must be paid for—it’s not a feature that automatically comes with the purchase. It’s also important to consider that the longer warranties will make the final bill more expensive. The EdgeStar Ice Maker can be thought of as a combination of the U-Line, the Mosel, and the Sub Zero Ice Maker combined. It has qualities that can be found in all three of the other ice makers, like an ice scoop, clear ice, and a cleaning system. However, this makes it difficult to decide on whether or not the EdgeStar is better or worse than the other models. Surprisingly, the EdgeStar is far less expensive than its counterparts. The price for this ice maker falls between $800 and $1,000. This makes the EdgeStar one of the most affordable ice makers on the market. Like the Sub Zero Ice Maker, the EdgeStar features its own ice scoop, which makes it easier to prevent messes. Because many ice makers don’t have scoops, this is a good quality for an ice maker to have. There is also a convenient switch on the outside of the unit that allows your machine to enter “ice” mode, “cleaning” mode, or “off” mode. The EdgeStar’s capacity is not the highest, but it is indeed not the lowest. This ice maker can create up to 45 pounds of ice per day, and it is capable of storing 25 pounds of ice within its storage unit. This makes the EdgeStar’s daily capacity about 5 pounds lighter than the Sub Zero Ice Maker. Ultimately, the design of the EdgeStar is the same as other units. It features a stainless-steel exterior, and a hard plastic interior. However, there is a drip collector at the bottom of the EdgeStar Ice Maker that might take away from the “streamlined” look of the design. The warranty for the EdgeStar Ice Maker is one year, which makes it quite average regarding appliances. 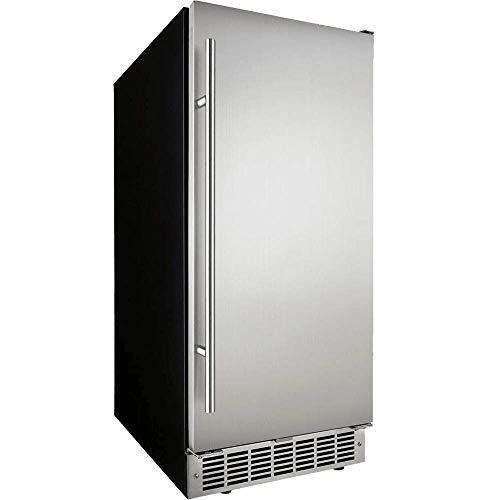 If you enjoy the low price of this model, then it might be worth overlooking this brief warranty period so that you can buy an ice maker for less money. However, if you’re more skeptical of the low price, then you might be happier investing in a newer model. The best 10 ice cube trays you can buy this year. The best in-built ice-makers out there. The Sub Zero Ice Maker can be likened to the cherry on top of a beautiful drink. Nothing really matches the satisfaction of having cool, crisp ice to drop into your drink at any time. We give this ice maker a thumbs-up for use in any kitchen, office, or mini-bar. Visit your online authorized dealer or local appliance retailer to pick up the Sub Zero ice maker.